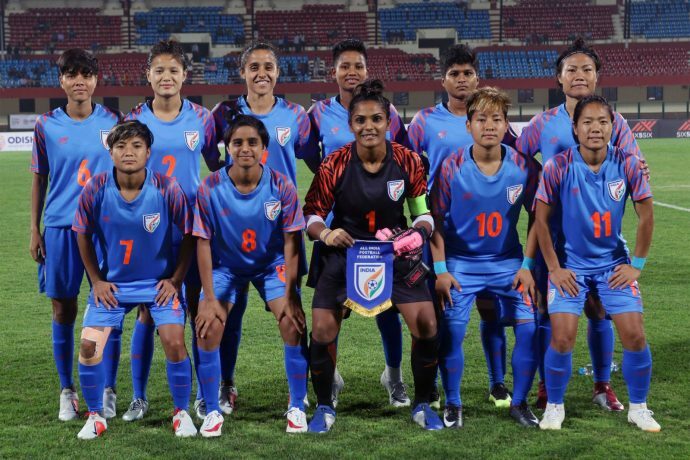 A dominant Indian Women’s national team began their campaign in the Hero Gold Cup on a winning note when they beat IR Iran by solitary goal played at the Kalinga Stadium in Bhubaneshar on Saturday. Anju Tamang’s match-winner in the 48th minute ensured India made it five wins in a row having won the last four friendlies against Hong Kong and Indonesia respectively. The first chance of the game fell to the hosts right in the second minute itself. Winger Dangmei Grace latched on to a loose back-pass and raced towards the goal. But the resultant shot, despite being on target was cleared away by the rival goalkeeper. After the initial scare, Iran began to make their way into the game but the Indians were equal to the task. The half was played predominantly in the midfield as both sides battled for territory with coach Maymol Rocky’s side enjoying the better of the chances. In the 15th minute, Anju showed some great skill to get into the box and cut in to find Ratanbala Devi. But her first-time shot was wide of the target. Seven minutes later, Sanju got her head to a cross, but the effort did not have enough power. India got their next chance in the 30th minute after a searching ball from the right flank caused chaos in the Iranian penalty area. The ball fell to Ratanbala, who had her back to goal and laid it off. But the shot was cleared on the line by a rival defender. As the match headed towards the interval, Iran caused a serious scare for the home side as forward Sara Ghomimarzdashti ran through towards goal. Her shot was on target but Indian custodian Aditi Chauhan stooped down to prevent any damage. After the breather, India got off to an electric start as Ratanbala played in Sanju and her shot from a tight angle just flied over the crossbar in the 46th minute. Spurred, the same duo combined excellently two minutes later to set up the opening goal. Sanju was played in behind the defence and with an excellent first touch she drew out the rival goalkeeper. With her second touch, she then squared the ball to Anju, who slotted it home to give her team a deserving lead. Three minutes later, Indumathi took aim from distance. But her powerful effort whizzed past the post. Iran looked to look more apply pressure but the Indian defence stood firm. The centre-back pairing of Ashalata Devi and Sweety Devi were excellent in the positioning, while Aditi was calm in her handling marshalling her troops well. The visitors continued to throw players forward, leaving them vulnerable on the break, and India almost grabbed a second in the manner but were denied by the woodwork. Sanju found space at the edge of the penalty area and went for goal, but her shot came back off the crossbar. Meanwhile, in the first match of the day, Myanmar recorded a 3-0 victory against Nepal. Win Theingi Tun scored one goal, while Khin Moe Wai grabbed a brace to pick up all three points for the team. HPFA GS Deepak Sharma: FIFA U-17 Women’s World Cup will energize the nation!